Beauty Serum for The Perfect VTM. Required for more intensive skincare (prone to ingrown hair and/or red bumps). Revitalizes the V – soft and velvety skin – slight temporary affect. Nannochloropsis Oculata Extract works to temporarily tighten and tone skin for a more youthful appearance. Kalparine, a seaweed extract works to soothe, moisturize and prevent wrinkling. Squalane, Sodium Hyaluronate and Vitamin E condition skin. Organic Licorice Root Extract and Chamomilla Recutita Flower Extract anti-inflammatory properties. Alaria Esculenta extract protects and firms the skin with its Omega 3 & 6 helps protect against collagen and elastin degradation. Anti-oxidants A, C & E help to combat the elements responsible for the visible signs of aging and also function to calm the skin. 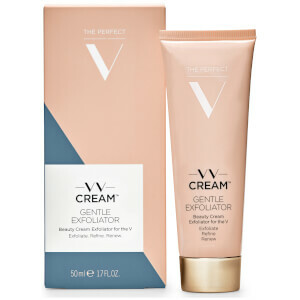 Melts into skin, quick dry down, soft after touch, ready for V V Cream™. 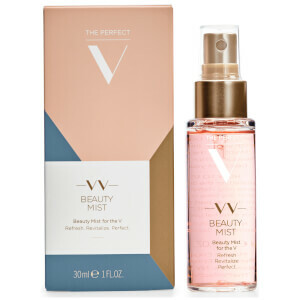 The Ultimate Pampering beauty item for the V.
For best results lightly dry the V area* and apply a small drop of V V Serum™. The perfect base for V V Cream™. Use daily as part of your beauty VANICURE™ regimen. Aqua (Water), Caprylic/Capric Triglyceride, Glycerin, Rosa Canina Fruit Oil, Squalane, Phenoxyethanol, Sodium Polyacrylate, Acrylates/Vinyl Isodecanoate Crosspolymer, Pullulan, L-Arginine, Nannochloropsis Oculata Extract, PEG-40 Hydrogenated Castor Oil, Alaria Esculenta extract, Chlorphenesin, Sodium Phytate, Tocopheryl Acetate, Rubus Chamaemorus Fruit Extract, Potassium Sorbate, Sodium Benzoate, Chamomilla Recutita (Matricaria) Flower Extract, Glycyrrhiza Glabra (Licorice) Root Extract, Melissa Officinalis Leaf Extract, Symphytum Officinale Leaf Extract, Sodium Hyaluronate, Rosa Canina Fruit Extract, Sambucus Nigra Flower Extract, Vaccinium Myrtillus Fruit Extract, Vaccinium Vitis-Idaea Leaf Extract, Hippophae Rhamnoides Seed Oil, Citric Acid, CI 77019 (Mica), CI 77891.